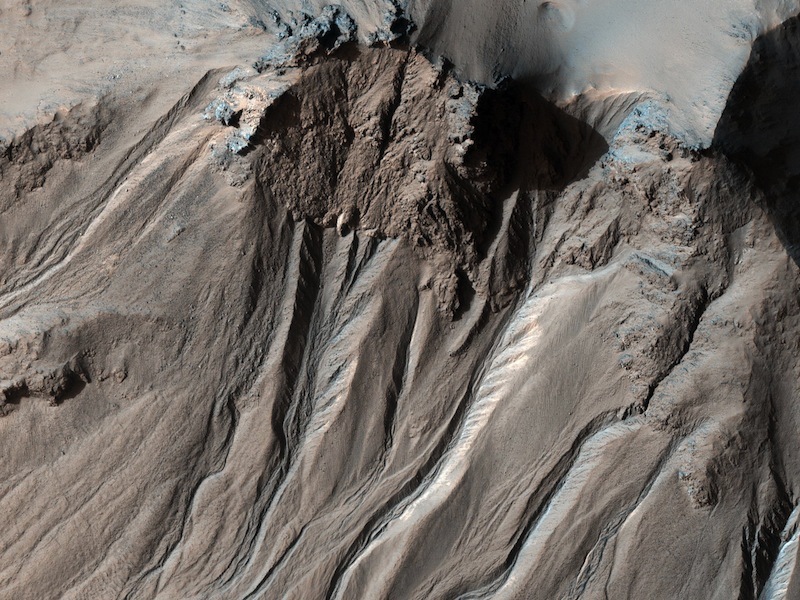 Gullies lie at the small-scale end of Martian channels. They are typically about 10 meters (33 feet) wide and a few hundred meters (yards) long. At present, several features are lumped under the term "gully" that may in fact have different origins. For now the term gully can stand, but as scientists learn more about them, the terminology may change. 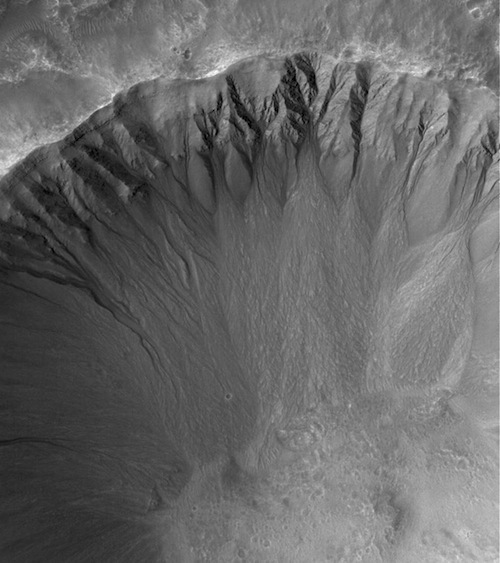 Gullies form on steep slopes, such as the inside walls of craters, and mostly on pole-facing slopes. At the top, they typically have an alcove that narrows downward into one or two channels. The channels run downslope until near the bottom, where they commonly end in a triangular fan of debris. What makes a gully? Scientists lean toward a “water-from-snowmelt” explanation for this type of gully. Snow would fall on the slopes and accumulate thickly in the alcoves. Then in local summer, long hours of sunlight on pole-facing slopes would cause the snowpack to melt and water would trickle down. After eroding the gully channel, the washed-down debris would collect in the fan at the foot of the slope. Supporting this model are observations of snowmelt in gullies on steep slopes free of vegetation in Iceland and the Canadian Arctic on Earth. A variation on this type of gully can form on sand dunes. 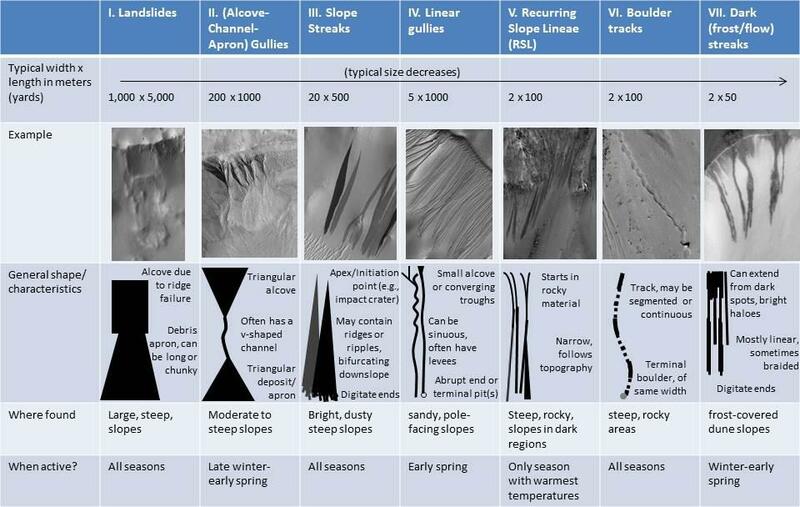 These dune gullies are usually on slopes facing the nearest favor pole-facing slopes, occur in large numbers on a single dune, are a few meters (yards) wide but several kilometers long, have small or no alcoves at their heads, and no debris fans at their lower ends. The gully channels are flanked by raised edges (called levees). Erosion by snowmelt doesn't fit this second type of gully very well. Instead a new hypothesis suggests that blocks of carbon dioxide ice sledding down the slopes erode the gullies. The blocks form each winter as CO2 freezes out of the atmosphere onto the dunes in a thin, solid slab. In spring, the growing warmth would cause the ice slab to break up into blocks. These would float on a very thin cushion of CO2 gas as the blocks sublimate. Gravity could then move the blocks downhill. As they slide they would plow a narrow path, pushing up levees on either side. At the bottom of the slope the blocks would sublimate completely into the air, leaving the gully channels behind. This hypothesis is new, and scientists are testing it in the laboratory and in the field on Earth.